By now, summer has definately left the building. It lasted a nice long bit into October, but right now Budapest has grey skies, howling winds, cold rain, and we face another six months of that grey, noxious east European cold that reminds one that as regards climate Hungary is, essentially, the European equivalent of the US' midwest. Think Ohio or Indiana in winter. OK, you can now stop thinking about it. Sorry. That ends our happy routine of a daily coffee break at neighborhood outdoor cafe. Until last week, we had wonderful, warm fall weather, and we would often stop by the nearby Flóra Cukrászda on Erzsébet Királyné utja in Zugló for a coffee and a slice of cake. Not just any cake, but the National Cake of the Year! The Flóra is only one of our neighborhood pastry, ice cream and coffee parlors, but since it is near and has a couple of outdoor tables, it gets most of our custom. And it features the last few years worth of "national cakes." Such as the "Szatmar Plum Cake" seen above, winner of the 2009 National cake award. Apparently, each summer the National Pastry Bakers Association holds a competition for the best cake to represent a national birthday cake on the national holiday of August 20th, and our local cukraszda features these prominently on their top shelf. And these are goooood... given that pastry and cake baking are something Hungarians do very well, it is frightening to see how well they can outdo each other on a yearly basis. These babies go for about FT 400 a slice, which is not bad compared to downtown cakes or anything you might encounter in any other European city. You are getting the best slice of cake in the civilized world (outside of Milan, I mean) for two bucks. You just can not beat that. Even if you don't like cakes. I don't know where the Flóra gets its cakes - they are certainly not baked on the premises - but they do take pride in their quality and they are always fresh. Fresh cake and coffee is something we absolutlely take for granted in Budapest and something we always miss when we go abroad. We're spoiled. We know it. We like it. We don't actually eat cake that often, but when we do we like to do it outside in the late morning, taking out time and enjoying a sunny day. Well, that's over with until next May, it seems. Around this time of year all the outdoor cafes pack in their tables and Budapest goes into Arctic Explorer survival mode, huddled down in their heated ice dugouts waiting for the next planeload of supplies to be dropped onto the icy wastes of McMurdo Sound. For the next few month we will gnaw on our hard rations of seasonal beigli and kifli until the sun comes out, the tables return, and the new cake of the year returns to reign again. On another note: Fumie posted a video she took from our MuPa concert on her youtube page. She had full permission to do photography at the hall, so she stuck her digital camera in video mode on the edge of the stage during the encore. Since we both only use our little Nikon Coolpix digital cameras for video, we aren't going to win any cinematography awards soon, but this is what we have - way too many Jews, Magyars, and Hutsuls singing and playing at once. Our concert of Di Naye Kapelye with the Técső Band at the Budapest Palace of Arts on October 1 went well - considering the logistics of getting everybody together, rehearsed, and playing while speaking in in six languages simultanesously. 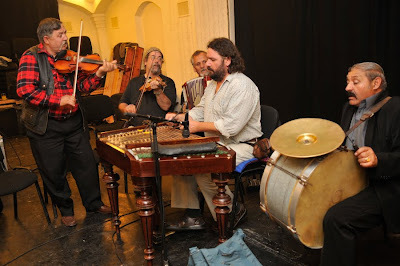 The operative languages in this group are mainly Hungarian and Hutsul Ruthenian, although I speak rudamentary Romani (Gypsy) with Ivan, the Técső fiddler, who is the only member who doesn't speak Hungarian. Yankl speaks a bit of Magyar, but since he hadn't been in Hungary in four years it was justifiably rusty. Six languages per rehearsal or gig. Just try that in your local bluegrass band. It was a blast just leading a band of this size - something I have only experienced while teaching Klezmer music workshops, in which case it isn't like you are really fronting a band as much as leading the High School orchestra in band practice. 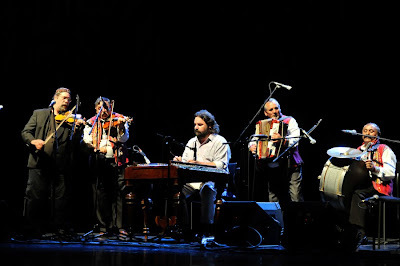 I think this was also the first time the Técső Band played a full blown concert hall - they usually play folk festivals and bars, but they were mighty impressed with the hall's acoustics and the blue ribbon treatment that one gets backstage at the Palace of Arts. When you have that many musicians - and none of us play from music notation - you've got to get a rehearsal in, just to shake out the bugs and eliminate those awkward surprises. When I was just starting out in music there were bands that I played in where everybody would just stop onstage and look at each other when somebody missed a cue or made a mistake. A professional musician is not necessarily guaranteed to not make a mistake now and then - he is paid to act like it never happened. The evening before the concert we had an open rehearsal in the basement of the Siraly in the seventh district, mainly to run through the tunes we would play together. 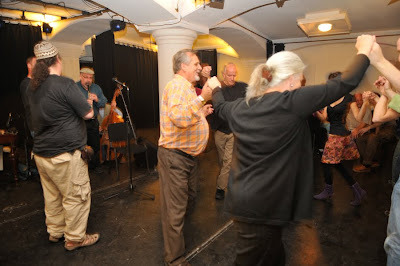 After a while friends drifted in and we ended up playing for a full blast klezmer dance session. Veteran Klezmer dance teacher Sue Foy led the freylakhs, and it wasn't surprising that Joska joined in seeming to know the dance already. We also had both of our clarinet players along for the ride. When you really want to blow an audience away, use two clarinetists and two lead fiddlers. Works like a charm. Our main man when playing internationally is Yankl Falk, from Portland Oregon. But Yankl can only get to Europe for the longer tours, so a lot of the local work is taken by Janos Barta, who was one of our first clarinetists and who now leads the Veszprem Klezmer Band. 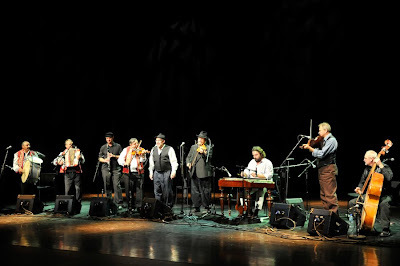 Our next gig (without the Técső Band, alas, but with the guest appearnce of New York Klezmer fiddle prodigy Jake Shulmen-Ment whose new CD "A Redele" is now out) will be in Bucharest on November 4 at the Museum of the Romanian Peasant concert hall. (Clubul Țăranului la Muzeul Țăranului Român, Şos. Kisseleff, Nr. 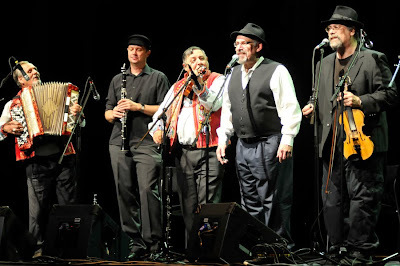 3) A little taste of what Jake does: with Raoul Rothenblatt (bass) and Pete Rushevsky on tsimbl playing a set of Klezmer fiddle tunes from collections I gathered in Iasi fifteen years ago. Jake does my stuff better than I do!